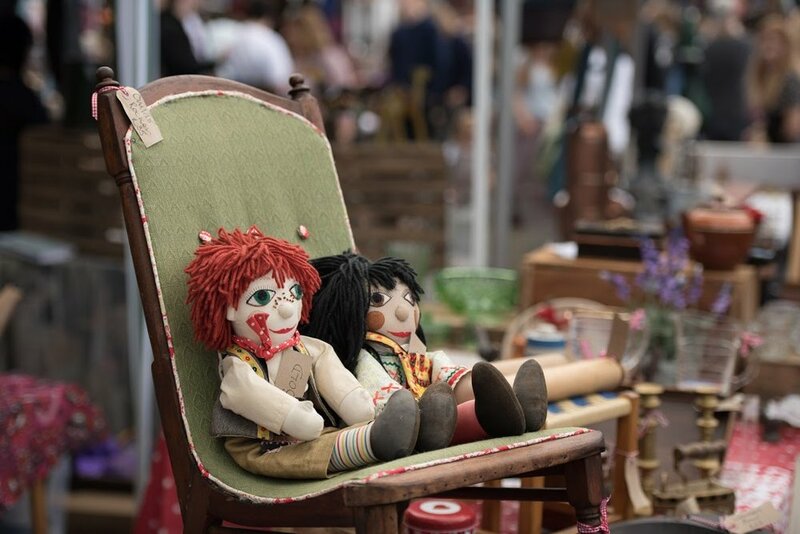 Vintage enthusiasts will no doubt be familiar with the treasure trove of goodies on offer each month at the Frome Flea, the sprawling vintage and antiques market which forms part of The Frome Independent each month. But for serious nostalgia enthusiasts, Frome offers a wealth of delights hidden beneath the surface in between market days; you just need to know where to look. On one such excursion, we popped in to The Life of Riley, an eccentric vintage shop halfway up Catherine Hill where we caught up with resident WWI expert, Sioux How, who also happens to be the manager of the Frome Flea. 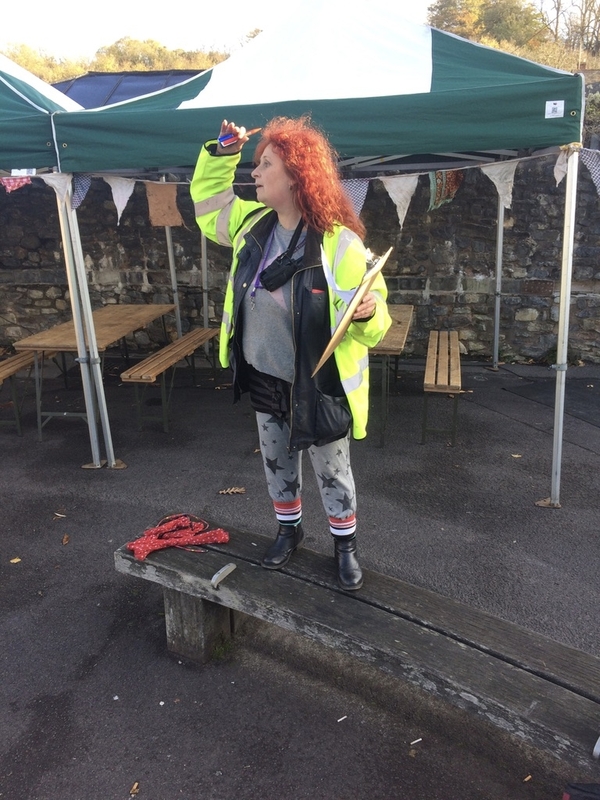 She told us about a day in the life of a market manager and shopkeeper, and why Frome is a treasure trove of vintage finds, both on market days and in between. You’ve been with The Frome Independent for a few years now. 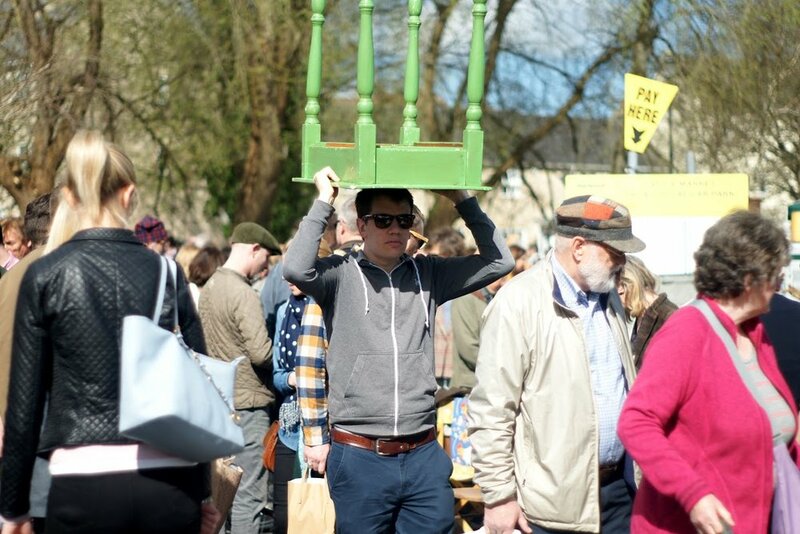 Tell us about your work and how you came to get involved with the Frome Flea. I’m a historical curator and events producer. My heritage theatre company, The Little Victory Ball, researches, collects and exhibits stories from WWI and WWII. We create immersive productions based on personal accounts and experiences from those years. I have been working for The Frome Independent for about three years, managing the Frome Flea. When I was a punter, I used to regularly attend the market and think the atmosphere was amazing. All the visitors wandering down Catherine Hill and shopping in the independent shops made me excited about living in Frome. The flea market pulled me in as I often bought authentic props from the traders, and soon I began to trade there myself. The Little Victory Ball was invited to run events on Armistice Day and in the summer months too (we have a vintage ‘hook-a-duck’ set-up which is a great addition to the flea market section). I was asked to get more involved and come on board with event production and to manage the Flea in 2015. Over the last three years the flea has developed and grown, and we now fill over 60 pitches every month. The traders come with stories as well as beautifully presented and researched stock. What’s a typical market day for you? I have a brilliant team of Frome locals who help with set up and take down. We start work at 6am – in the winter months it is dark and cold but the traders are always ready and waiting to come onto site and set up. We measure up pitches, set up gazebos, hook up electricity for food and drinks traders, and the Vintage Mobile Disco. We also set out the Village Green astroturf, hang bunting and install event scenery and props. I also oversee the Village Green events such as donkey rides, fancy dress competitions, and Frome-On-Sea! In August, the team also shovels two tons of sand into place for the pop-up beach. The traders come in at 7am and my crew get them into position whilst I welcome at the gate and give them a quick briefing of what they need to know for the day. As a former trader myself I know how important this is, particularly for new traders. Set up is just the beginning. Throughout the day I’m on hand to work with the other market managers – no two market days are the same and we are always working behind the scenes to address weather changes, lost children or dogs, power loss, and trader queries. At 3pm my crew return, and we pack away the Flea until the next month. I usually get home at 6pm. Why do I do it? It’s hard work, but I love working as part of a team, problem solving, seeing the space transformed from a dark, bare car park into an event for everyone to enjoy. I love meeting the traders and hearing their stories and the knowledge they have about their stock. I quite like having a walkie talkie too! You also work at The Life of Riley, a vintage homewares and antiques shop on Catherine Hill; how did that happen? As a collector of early 20th century objects, which I use in both my performances and in my home, part of the reason I moved to Frome ten years ago was due to the array of vintage shops. I found The Life of Riley, and would pop in regularly for chat with Jo, the owner. She loves to talk to her customers and get to know their interests. One evening I walked past the shop and noticed, in the window, a collecting box from 1919 with a pile of magazines. I recognised that it was from an obscure charity for WWI veterans and was something I could use in one of my projects. I was very excited, so I rushed home to find the phone number of the shop and rang Jo. As soon as I said hello she replied, “Oh, it’s you dear. I knew you'd ring. I know what you want; I put it in the window so you would see it.” How brilliant was that? Proper shopkeeper behaviour! Earlier this year, Jo invited me to come and work with her a couple of days a week. I think we are similar in many ways – we have the same work ethic and humour, and love the more obscure vintage pieces. Working in The Life of Riley is like working in a sitcom. People come in with bags of items to sell us, people come in looking for an obscure or very specific item (and often find it), and others seem to think we are an “Ooh, remember when we had one of those Joyce?” reminiscence gallery. The majority of our regular customers are local people who like a chat, but we also source specific items for stylists, theatres and businesses. Our items are left in the condition we find them, we don’t do upcycling! Our regulars like that rawness and authenticity. 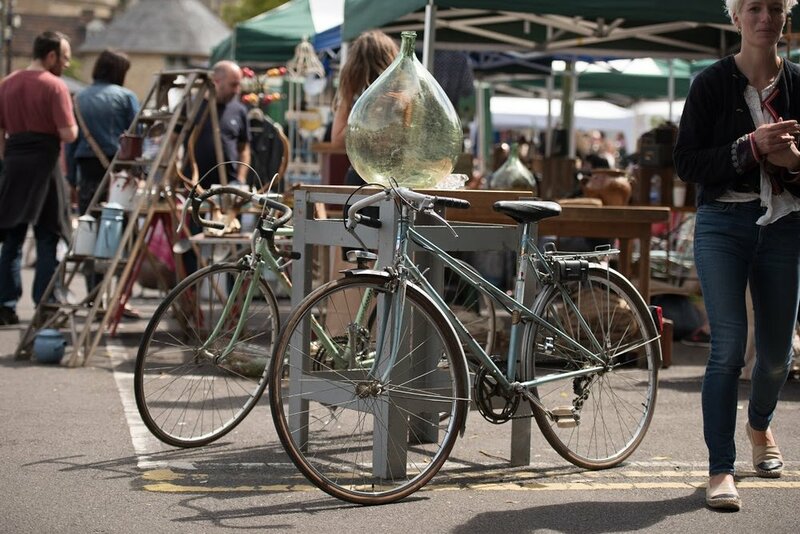 What do you think makes Frome such a popular a shopping destination for vintage enthusiasts? Opening a shop in a small town can be risky. The owners of Frome’s vintage shops have a passion for what they sell. The convenience of internet shopping does not compare to a passionate shop owner who has sourced their stock and has knowledge about the items. At The Life of Riley, we have, very recently, started to use Instagram, but we don’t sell online. We encourage our customers to come in and talk to us about their interests and collections, touch the items and even smell them! Vintage in Frome is not often easy to find, but this encourages those of us in the trade to get to know the other shopkeepers and what they sell, so that we can signpost our customers to other shops. It’s that community element that you don’t always find in heavily curated shops or online. As well as the Frome Flea, there’s a weekly flea market at the Cheese & Grain, and lots of small shops and emporiums tucked away. There’s a great auction house too. Jo has been in the trade for many years, building an extensive knowledge of where to source pieces that are unusual, tell a story, or have a timeless appeal. She has a client list and phones people up if she finds good pieces that she thinks they’ll like. She’s quite old school like that! You have extensive experience as a historical curator and are locally renowned for your knowledge of WWI and WWII. How does this inform your work as a shopkeeper and at Flea? History and authenticity are the core of all the work I do. My work with The Little Victory Ball means I spend a vast amount of time researching alone in my office and prop room. I can get lost in my own head so need other people to work with, to play about with ideas and to get me out of my study. The joy of working in the shop and at The Frome Independent means I meet people to share my love of the past. I also hear their stories, which I often use as inspiration for my plays. I think it is important for traders and customers to recognise a mutual interest in artefacts and history; talking to these people makes me smile inside. What’s next for The Little Victory Ball? We have just completed a three-year Heritage Lottery funded project which culminated with our sell-out Grand Peace Ball event earlier this year. I am now working on a tiny cabinet of curiosities which will be presented by two very odd munitionettes. I am also working on a Frome-based project which will be revealed early in the new year so watch this space! The Frome Independent’s Frome Flea can be found on the first Sunday of the Month, March-December in the Market Yard car park in Frome, Somerset. You can follow The Life of Riley on Instagram @joliferiley. The Little Victory Ball’s latest show will be available for bookings in 2018 to commemorate the last year of WWI. Get in touch with Sioux via littlevictory ball@gmail.com if you’d like to get involved. You can read more about The Little Victory Ball in SOME SUCH magazine issue one. Click here for more information. You can read more about The Frome Independent in SOME SUCH magazine issue two. Click here for more information. It’s that second novel or hit record feeling! How to follow up a smash hit? The very first Bruton Decorative Antiques Fair in October 2016 at the luxury laden Haynes International Motor Museum was indeed a smash hit with buyers flooding in from across Somerset and the rest of the world! But there are no jitters in 2017 at Bruton Decorative Antiques Fair HQ in Burnham on Sea in Somerset because the organiser are already running a waiting list for hopeful dealers with some brilliant new names on board, Bombe Interiors, Branching Out Antiques and Elham Antiques all from Kent; Kore Purchase, Tetbury; John Read Smith, Herefordshire; Molly & Maud’s Place and Chris Holmes Decorative Antiques, both Yorkshire; and The Archives from The Netherlands. And with a big sister like the Bath Decorative Antiques Fair just up the road in the Georgian City, running at an all-time high in March 2017, after 28 years, the traction is red hot and the Bruton Decorative Fair is getting ready to motor back to the Haynes International Museum for a spectacular return from 11th-15th October 2017. Decorative dealers pull out all stops at this show and there will be choreographed displays from some of the most exciting decorative dealers in the UK, Europe and the Channel Islands with C18th – C20th decorative trouve for the home and garden, English Folk Art – early pottery, samplers, walking canes, CMid furniture and accessories, lighting, textiles, grand painted furniture from local country houses, lighting, mirrors, dazzling jewels and even vintage desirable designer handbags. Owners of the fair, Sue and Peter Ede of Cooper Events, who also own the madly successful Shepton Flea, had been trying to find a location for a companion fair for Bath Decorative Antiques Fair with exhibitor pressure mounting for a second event on the calendar. The transformation of the sleepy Somerset town of Bruton into the ‘Notting Hill of the South West’ with the arrival of the internationally renowned Hauser & Wirth Gallery, which instantly lit a media fire under this untouched corner of leafy Somerset, drawing an influx of city money, second home owners and celebrities to the area which created a light bulb moment for Sue and Peter and they found the perfect site - the £6million extension to The Haynes International Motor Museum, with its luxury interior and extraordinary raspberry red futuristic façade, just outside Bruton and very hi-viz from the adjacent A303. A number of notable Somerset dealers will exhibit again in 2017 including The Factory in Castle Cary, home to seven leading dealers from the decorative trade founded by David Tupman Antiques. Sharing the beautiful former dairy house factory in Castle Cary are Brighton based dealer Jill Palmer, Pimlico dealer Christopher Butterworth, London based Derek Greengrass and Ashburton, Devon dealer Roger Organ. Expect to see a highly charged eclectic mix of decorative antiques for the home and garden. Alchemy from Bruton will also be returning with French and English upholstery, dining tables and chairs, C20th century glass tables, beautiful English and European mirrors, textiles, and a selection of contemporary art and sculpture; Quillon House Antiques, also Bruton based, with fine country furniture and accessories; Wharton Decorative Antiques based between Frome and Bath, dealing in French fireplaces, architectural reclamation and decorative antiques; Elizabeth Lee Interiors from Frome with French, Swedish and English decorative antiques for the home and garden; and just across the border into Dorset, Sherborne based Macintosh Antiques with painted country house furniture and upholstery from the leading furniture makes of the C18th – C19th, and English mirrors; and The Jerram Gallery, British Contemporary pictures and sculptures. Complimentary tickets and full information via the website. Bruton Decorative Antiques Fair 13th-15th October 2017. Trade Preview: Friday 13th October, 11am-2pm. Public: Friday 13th, 2pm-5pm. Saturday 14th and Sunday 15th, 11am-5pm. This month saw the launch of NIGHT SCHOOL, a new series of evening workshops hosted by The Frome Independent, intended to provide an opportunity for people to gain hands on experience of contemporary craft. Night School is a series of one-off sessions where participants of all abilities can learn under the expert guidance of some of the market’s and Frome’s best designer-makers and food producers. Classes take the form of affordable one-off taster sessions, giving participants an introduction to bookbinding, blacksmithing, food fermentation, leatherwork and printmaking - to name just a few. For around £35, participants get to learn a new skill from an expert maker in a friendly and supportive environment. As it turns out, Frome residents and market fans are all quite a creative bunch, with every course in the Spring/Summer programme selling out within days of its launch. The first Night School class took place on Thursday 9th March with a full complement of budding printmakers. Anna Brindle of Lost Shapes led a cohort of classmates in designing and making their own tote bag over a three hour session. A Frome born-and-bred maker, Anna is also a passionate advocate for ethical textile production and slow fashion. Her clothing ranges are bold and distinctive, all hand-printed in her Wiltshire studio and can be regularly found in the Designer Maker section of The Frome Independent. Along with Anna, some of The Frome Independent’s most highly regarded craftspeople and food producers are taking part as tutors. The Spring/Summer season sees blacksmithing with Alex Pole Ironwork, whittling with Hatchet + Bear and food fermentation with Wild & Fermented, and photography, leatherwork, textile and bookbinding sessions are all lined up for later in the year. Almost every workshop in the Spring/Summer programme is now fully booked, with details for the Autumn/Winter programme due for release soon. 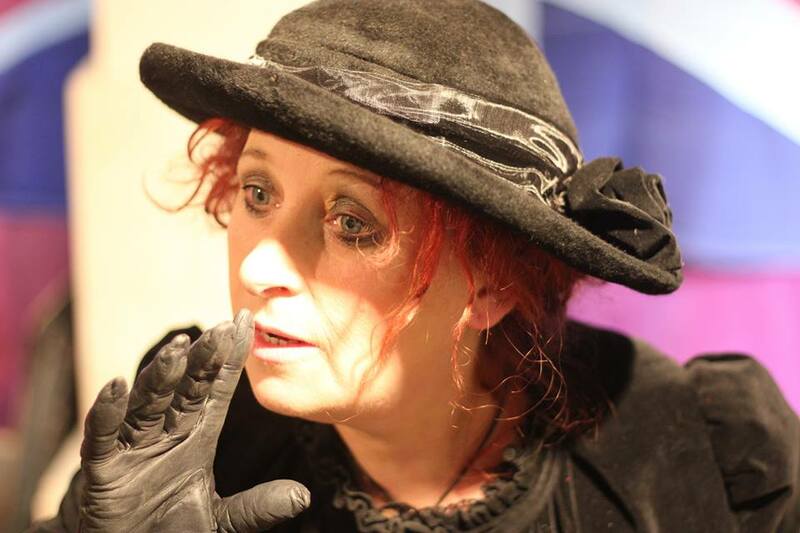 Tabitha Clayson, director of The Frome Independent was pleasantly surprised by Night School being an instantaneous hit, and feels that this chimes completely with Frome’s growing success and the market’s popularity. For those of you unfamiliar with The Frome Independent, it really is a market like no other. Taking over the entire town centre of this east Somerset market town on the first Sunday of the month, the event closes the road to traffic to make way for more than 200 craftspeople, designer-makers, food producers and traders of vintage clothing, homewares and furniture. The Frome Independent is a curated market, and the sister organisation of Foreground, Frome-based contemporary visual arts commissioners with a remit to bring new art to new audiences across the south west. As such, the market now includes some of the very best designers, makers, food producers and creative entrepreneurs in the region, and attracts visitors from across the country. But the event isn’t just about shopping; the small market team work hard to create a free monthly event for all the community to enjoy, with live music, family activities, themed markets and visual arts events creating a mini festival atmosphere on market days. It’s this ethos of being ‘more than a market’ that inspired the idea to launch Night School. Tabitha says that the work of The Frome Independent extends beyond market days, and is more about promoting a different way of life, one where we ditch screens and multinationals and get back to making things with our hands and buying directly from makers again. The Frome Independent takes place on the first Sunday of the month April - December throughout Frome town centre, and is free for all to attend. Night School classes run on Thursday evenings throughout the year at Forward Space Work Hub. The full programme is available to view on The Frome Independent’s website and if you want to be the first to hear about new courses you can sign up to their mailing list there too. We returned to Glastonbury’s Dilliway & Dilliway recently and fell in love with this gorgeous shop all over again. © 2016-2018 SOME SUCH Magazine. All rights reserved.